Klotz Floral Design & Garden has been proudly serving the Bowling Green area for over 100 years. We are family owned and operated. We are committed to offering only the finest floral arrangements and gifts, backed by service that is friendly and prompt. Because all of our customers are important, our professional staff is dedicated to making your experience a pleasant one. That is why we always go the extra mile to make your floral gift perfect. Let Klotz Floral Design & Garden be your first choice for flowers. *We are open in the Flower Shop & Garden Center Monday-Friday 9 am to 5:00 pm Saturday 9 am to 3 pm To help assure on-time delivery during the busy holiday season, place your order at least 1 day prior to the following major holidays: Thanksgiving Day, Christmas Day, New Year's Day, Valentine's Day, Easter, Administrative Professionals Week, Mother's Day, Memorial Day, Father's Day, Independence Day and Labor Day. Our shop will always be closed on the following holidays: Thanksgiving Day, Christmas Day, New Year’s Day, Easter, Memorial Day, Independence Day and Labor Day. Founder, Frank Klotz, born in Bowling Green, Ohio in 1881, lost his hearing when he was eight years old. Two years later he was enrolled in the School for the Deaf in Columbus. That is where he learned sign language, studied greenhouse operation, and met his future wife, Anna Mae Householder, who also became deaf at a young age. It was this education that gave him the knowledge and experience to eventually return to his hometown and start his own gardening business. Frank Klotz started his business of selling tomatoes and other vegetables from the open sides of his truck. In 1918, after working for other greenhouses in Canada, Ohio and Arkansas, Klotz decided to go into business for himself. He bought 20 acres of the family's property on Napoleon Road. Frank began by placing homemade wooden flats filled with vegetable plants on a bed of horse manure in a single hotbed. Business expanded within a short time and soon flowers were added to the Klotz Business. By that time, he had a dozen hotbeds and cold frames and a greenhouse with 650 flats to grow 65,000 plants. Though Frank saw many changes in the business during his almost 20 years of labor intensive work, his son, Merle and his wife Wilhelmine, saw many more changes to the buildings and in the technology of growing plants during their years of running the family business. 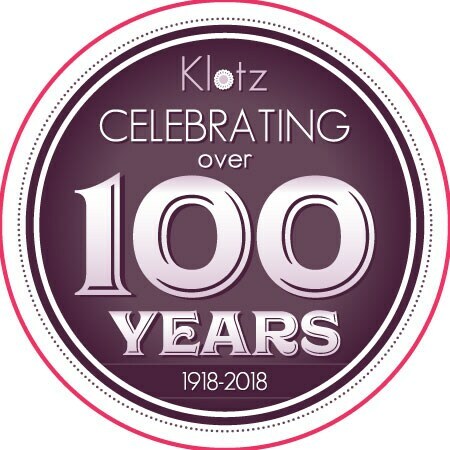 Since 1973, Klotz's has quadrupled in size with expansions made to the floral and gift shops and construction of new greenhouses. Now, 98 years later, the business has blossomed into complete floral shop, gift shop, garden center. Currently running the business is Gene Klotz, grandson of the founder. Other family members currently involved in the business are Gene's wife, Rita, and their son Eric. Klotz's philosophy is to provide our customers with top quality service and products. Our mission is to enrich the lives of the people and community around us with the natural beauty of flowers and the joys of gardening. We are committed to knowledgeable, courteous service, the best quality flowers and plants, and a friendly, welcoming shopping experience. We are always changing to keep up with new trends and changes in the industry. Though we are proud to be celebrating 98 years in business we don't want to look like we're 98 years old. Our commitment to you is 100% satisfaction on all your floral and gift purchases. If you are not completely satisfied, let us know by calling (419)353-8381. If you have any questions or need more information, please call us directly at (800)353-8351. We're always here to serve you and make your flower-sending experience a pleasure. Delivery fees will vary depending on the zip code of the recipient. All delivery fees will be reflected on the order summary page before the order is placed. If there are any questions in regards to the delivery fee please feel free to give us a call. U.S. orders must be received before 2:00 p.m. in the recipient's time zone to assure same-day delivery. Orders received after that time will be delivered the following day. We will do our best to accommodate deliveries at specific times of day, but we cannot guarantee it. We only make deliveries on Sundays for funerals. Any other delivery will be delivered the following business day. Delivery of orders to rural route addresses or cemeteries cannot be guaranteed. We will be happy to accept your international orders if you call our shop directly. We are unable to accept international orders over the Internet.